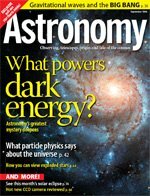 If you are interested, but perhaps a little confused about cosmology then it might be worth checking out the September issue of Astronomy magazine. A wide range of subjects including gravity waves, particle physics, and dark energy are covered in a number of articles. All in all a good introduction to the subject. Also look out for a special edition called COSMOS due out sometime in October.